Over the last few days, I have been doing research on the children and grandchildren of my 2x great grandmother, Elizabeth Ann Ball. Elizabeth Ann Ball was born in 1856, and married in 1875. Her first child, Mary Ann Oliver, was born in December 1875. Dorothy Vera Swan born in 1899. Mary Ann Swan, nee Oliver, died in 1942. Given the marriage year of 1898, it was unlikely that they had any children after Olive, but there was a possibility there may have been another child born between Annie and Olive. I therefore decided to check through my research, and found that Annie and Olive were the only births that belonged to this couple when I searched for the surname Swan, father Alf* on the Great War Index (which covers the years 1914 to 1920). Although it seemed unlikely that there were any more children, the first thing to do was to try and find death notices or obituaries for Mary Ann and Alfred, to see if their children were mentioned. This notice didn’t mention any children at all. 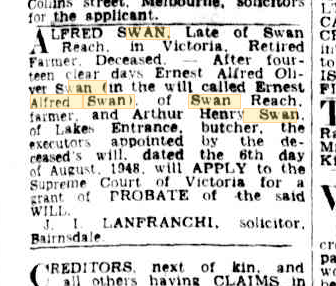 This death notice showed that Alfred Swan was deceased, but I had in my records that Alfred died in 1952. I had followed the couple in the Electoral rolls, and Alfred was listed as a butcher at Swan Reach up to the 1952 Electoral roll. 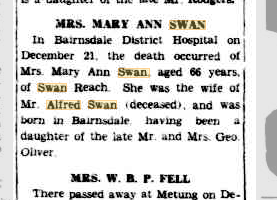 I decided to look for a death notice for the Alfred Swan who died in 1952, to confirm that this was Mary Ann’s husband, and I found the following death notice. Alfred and Mary Ann’s daughter Annie Isabella Swan had married William John Johnson. I also found the another article regarding Alfred’s will. These two articles confirmed the Alfred who died in 1952 was the husband of Mary Ann Oliver, and that an error had been made on Mary Ann’s death notice. The certificate also showed that she died 21st December 1942 at the District Hospital in Bairnsdale, and her usual residence was Swan Reach. Her occupation was home duties, and she was 66 years old. Her cause of death/duration of last illness were uraemia days, osteo arthritis of spine, months. Her parents were George Oliver, farmer, and Annie Oliver, formerly Ball. The informant was George Holford, Authorised Agent, Bairnsdale. Mary Ann was buried 22nd December 1942 at the Bumberrah Cemetery. The undertakers were Holford & Craig, and the minister was Rev. A. W. Sutton, Church of England. The certificate showed she was born at Bairnsdale, and had lived all her life in Victoria. She had married Alfred Swan at Bairnsdale when she was 22 years old.